Mumbai: Eicher Motors Ltd on Monday became India’s fourth most valuable automaker, displacing Bajaj Auto Ltd, which held that position so far. With this, Eicher, parent of Royal Enfield Ltd, has also become the country’s most valuable two-wheeler maker, beating Bajaj Auto and Hero MotoCorp Ltd, which have much higher revenues. With the 2.41% rise on Monday, shares of Eicher Motors, which makes trucks and motorcycles, have gained 38% since the beginning of the year. Data from BSE showed Eicher now has a market capitalization of Rs81,776.67 crore, after its shares closed at an all-time high of Rs30,040.60 apiece. The benchmark Sensex on Monday rose 0.63% to 32,514.94 points. Maruti Suzuki India Ltd is India’s most valuable auto company, with a market value of Rs2.34 trillion, followed by Tata Motors Ltd (Rs1.28 trillion) and Mahindra and Mahindra Ltd (Rs87,077.15 crore). Investors continue to buy Eicher Motors stock, attracted by the strong volumes, earnings growth and margin expansion. The company has also been generating strong cash flow over the past few years. 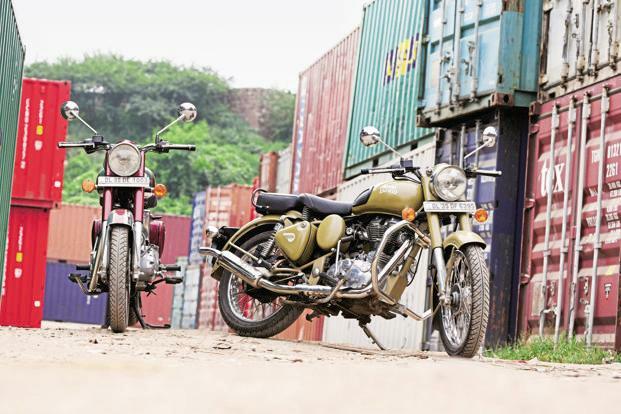 Eicher’s subsidiary Royal Enfield, which makes the Bullet and Thunderbird motorbikes, has seen brisk sales even as the overall two-wheeler market has remained sluggish. This has helped Eicher balance the cyclical weakness in its commercial vehicles business. In the three months to June, sales at Royal Enfield grew 24.7% over the last year to 188,000 units, according to industry body Society of Indian Automobile Manufacturers (Siam). Nirmal Bang has initiated coverage on Eicher with a “buy” rating as it believes its growth momentum will continue over fiscal year 2018 and 2019. The brokerage in a report said it expects 20% volume growth for Royal Enfield over fiscal years 2017-19. “We believe the demand in leisure bike and premium segments will continue to remain strong as the existing two-wheeler base (70 million) moves towards better and high-end products. Royal Enfield’s earnings before interest, tax, depreciation and amortization margin at 31% is the best in the industry, which we believe will expand further by 120bps over FY18E/FY19E as better economies of scales leads to further margin expansion” it added. Eicher will announce its June quarter earnings on 9 August; the median estimate in a Bloomberg survey of 14 analysts puts the company’s likely net profit at Rs453.10 crore and net sales at Rs 1966.30 crore. Bajaj Auto shares fell 0.54% on Monday to Rs2,807.60 and its market cap stood at Rs81,242.68 crore. Hero MotoCorp gained 0.6% and its market cap was at Rs72,971.22 crore. So far this year, Bajaj and Hero MotoCorp have risen 6.6% and 20%, respectively. On 20 July, Bajaj Auto reported weak earnings due to higher raw material costs, higher spending on advertisement and expiry of excise duty benefit at its Pantnagar plant. Its margins at 17.2% were 322 basis down year-on-year, and 126 basis points quarter-on-quarter. “The fall in June quarter margins is due to many factors: higher input cost, including BS IV costs (110bps), expiry of Pantnagar excise exemption (50bps), higher sales promotion on Platina/ CT100 in Apr-May, and early price cuts to pass on GST benefits,” IIFL Institutional Equities said in a 24 July report. On 26 July, Hero MotoCorp reported a net profit of Rs914 crore, up 3.5% from a year earlier. Revenue from operations rose 7.5% to Rs8,612.91 crore from Rs8,010.66 crore in the year earlier. Ebitda margin for the June quarter declined marginally to 16.3%, from 16.63% in the year-ago quarter.